A Camano Island Washington couple was dreaming of a horse arena and horse barn with stalls in a remote part of their property. The couple had concerns and questions as to the type of horse arena and stalls that would be best for their horses. 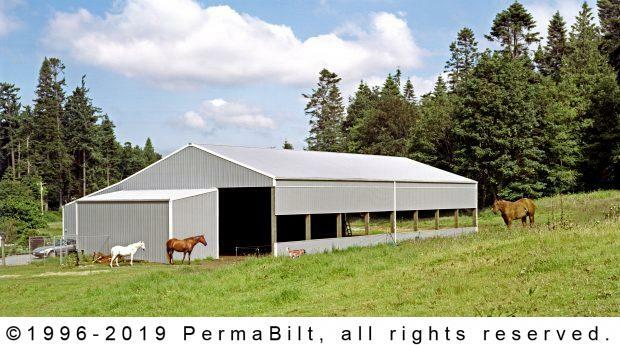 These concerns were addressed in an initial meeting with a PermaBilt® Building Representative. One feature they wanted was a wide and tall garage door so they could back their truck and trailer in and out with ease. This customer chose to finish their stalls and tack room after we had completed building the building. With the site cleared, we started construction on a 50’ x 96’ x 18’ arena that included a 24’ x 96’ x 12’ lean-to plus an attached covered space for future horse stalls. Upon completion of the arena, the couple took delight in allowing their horses to inspect their new living quarters and also their spacious covered new riding arena.